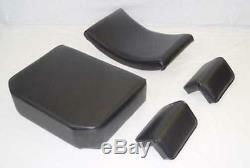 One New Aftermarket Replacement John Deere Seat Cushion 4 Piece Set that fit Crawler / Tractor models: 420, 430, 440, 1010, 2010. Please Take a Look at the Picture and Compare Them to Your Machine. There are a Few Variations. Includes #4, #5 & a Pair of #6 in Picture. 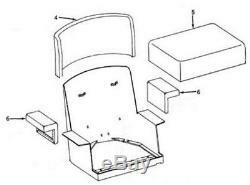 Replaces Part Number: JD4PCSEATCUSHIONSET (which includes 1 Seat Cushion # AT23482T, 1 Backrest # AT10138T, and 1 LH/RH Arm Rest Pair # AT10140T). The item "New Seat Made To Fit John Deere Crawler Dozer 420 430 440 1010 2010" is in sale since Tuesday, November 27, 2018. This item is in the category "Business & Industrial\Heavy Equipment, Parts & Attachments\Heavy Equipment Parts & Accessories\Antique & Vintage Equipment Parts". The seller is "reliableaftermarketpartsinc" and is located in Williamston, Michigan. This item can be shipped worldwide.